Portugal’s ratification of the Convention on the Rights of the Child has led to greater interest in children, and considerable resources have been allocated to ensure the education, health and welfare of young people. However, the poverty level among Portuguese children is disturbing, especially since the recent economic crisis has affected many families, resulting in changes to the lives of children. Portugal is among the eight countries with the highest poverty levels among children in Europe. Since 2009, poverty has increased in Portugal: 20% of children, or one in five, live below the poverty line. Their parents are usually without stable employment or unemployed. Some of these families do not have accommodation and live in slums or on the streets of Lisbon and Porto. It should also be noted that three out of 10 children live in a state of deprivation, a criteria for which is the lack of three full meals a day. Portugal has the highest HIV/AIDS diagnosis rate in Western Europe. Despite prevention campaigns, studies highlight the inadequate use of condoms among young people. Portugal is ranked among the three countries with the highest rate of infant deaths from ill treatment: 90% of abused children have been victims of domestic violence, which can have serious consequences on the physical and mental development of children. Despite a campaign to eradicate child labour, this phenomenon is still present, although according to official data it is decreasing. However, owing to problems encountered in verification, this decrease is open to question. While the law prohibits child labour, young persons under 16 years of age from the “Roma” communities often often beg for money. One consequence of the economic crisis is the large number of children leaving school to work and support their families. Children in northern Portugal are more affected than those in the South, being employed mainly in the textile, footwear and construction industries. Children involved in the manufacture of shoes earn less than one euro per hour. They run the risk of dropping out from school and lack professional qualifications. Although Portugal has ratified the International Convention on the Elimination of All Forms of Racial Discrimination, the “Roma” community is subject to discrimination, particularly in the areas of housing, health and education. The Portuguese government has implemented programmes to relocate “Romas” living in precarious conditions. However, rehabilitation in locations far from urban areas gives rise to transportation difficulties, which adversely affect access to basic services necessary for children. 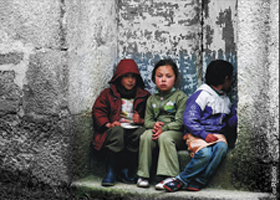 Studies show that the rate of enrolment in schools is lower among “Roma” children than in non-Roma children. 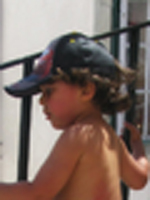 Many children from Brazil, Eastern Europe and Africa are sent to Portugal. They are used in the hotel industry, for domestic work and prostitution. These children typically suffer ill treatment and sexual abuse. Due to legislative gaps, child trafficking for sexual exploitation remains a serious problem in Portugal. Girls, especially those from poor families, are most vulnerable. With 5.7 tons of CO2 emissions per capita per year, Portugal is hardly a modelon environmental issues. Like adults, children should be allowed to develop in a healthy environment. However, Portugal, like many other countries, does not offer a favourable environment for the health of its citizens, especially its children.